If you haven't played the guitar very long, or you really haven't thought much about it, but the position of your thumb on the guitar neck is somewhat important to how you reach the notes and strings with your other fingers. It's something that early guitarists might not think about, but keeping those bad habits at bay is what we're all about right? Keep your thumb on the guitar in the middle of the neck. There's some controversy about whether this is the best technique. I've actually purchased Blink 182 tab books (when I was starting to learn guitar tunes) that tell you to play certain notes on the low 'E' string with your thumb hanging over the top of the guitar! However, I really do NOT condone that. I mean, Tom Delonge has written some crazy catchy guitar tunes, (let's not kid ourselves there) but he's not the most well-trained or impressive guitarist. So what's going to happen when you keep your thumb on the guitar behind the neck? * You'll strengthen your fingers. If you keep that thumb on the guitar in the back, your fingers will be forced to stretch and curve just a bit more as opposed to your wrist and forearm. And stronger fingers means more control when you're playing. * Getting a tighter grip on chords is a bit easier. 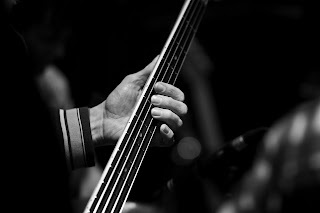 If you have your thumb planted firmly on the back of your guitar, you can really put some squeezing pressure on the fret board if you were having trouble before. Don't go crazy though! You really only need a little bit of pressure to push down those chords, otherwise you might need to adjust your guitar strings. If it seems weird to keep your thumb behind the guitar in the middle of the neck, maybe you just need to play things a bit slower for awhile. After a few practices it shouldn't feel any different when you're jamming on your guitar tunes. This is good advice. At first it's a little uncomfortable but you get used to it. even for my sister who's also wants to learn how to play guitar since we already know how to play pianos.. again, thanks you! @pianoLearningGuide It's awesome that you guys can play piano! I do a little myself. Never been formally trained so I can't read music, but on well.